Graphtec, Japan manufactures various high-end multi-function data loggers with a display. These data loggers are capable of measuring and recording various analogue and digital inputs. Features of these multifunction data loggers are explained below. It has multifunction input sensors including analogue and digital signals. High-speed simultaneous sampling from 10 milliseconds is possible. They have colour LCD screens capable of displaying graphs. The customer can easily transfer the data to a USB Flash memory. Also, data transfer through Ethernet Wired or WiFi connections is possible for different models. It is possible to make a different combination of a number of channels such as 8 channel, 16 channel, 32 channel etc. This is a 8 channel multifunction data logger capable of measuring different inputs such as temperature, v oltage, humidity, pulse and logic. 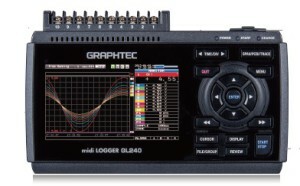 The 5.7 inch LCD color display is capable of displaying a clear graph of the input signals. The user can transfer data using a USB drive. We can have sampling interval from 10μs to 60 seconds. It also has 4 output channels for alarms or activating other circuits. It has a memory capacity to store One million readings. It can operate in normal power supply using a DC adaptor. Also, it can operate on battery. 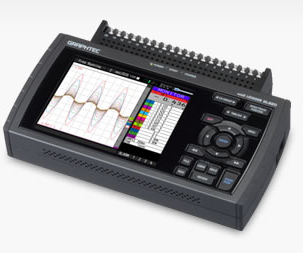 This data logger is capable of taking inputs from up to 200 channels using expansion units. It comes with a 4 GB internal memory and a display of 5.7 inch LCD. It also has a provision to insert SD card for additional memory. Also, data transfer is possible through USB and LAN ports. We can program alarm signals for each channel and it can generate external alarms. It has two models, one operating in LAN and the second one operating in WiFi. We can use it to measure Voltage, temperature, humidity, pulse, logic, AC current, power, acceleration, illuminance and CO2. It has a sampling rate from 10 ms to 2 seconds. The basic device can take inputs from 20 channels. We can connect additional input terminals to connect upto a total of 200 channels. This makes it a 200 channel data logger. It can transmit data to a Web and FTP server. The earlier version Gl 220 has been replaced by GL 240. This is a 10 channel handy data logger with only a weight of 500 grammes. There are 10 isolated channels and each is capable of taking different inputs. The device has 4.3 inches wide TFT screen. 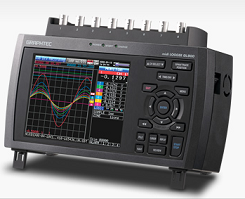 The sampling rate of up to 10ms can be programmed for each channel. It has a built-in memory of 4 GB through an SD card. It can take inputs for Voltage, Temperature, humidity, pulse and logic. There are two models, one having wired data transfer and the second one having WiFi facility. This multichannel data logger has a sampling interval from 10 ms to 100 ms. We can connect all types of thermocouple inputs for measuring any temperature range. Vacker Arabia supplies all types of multi-function data loggers in all cities of Saudi Arabia covering Jeddah, Dammam, Riyadh, Jubail and Khobar.